I woke up early yesterday morning. Reached for my phone, checked the site, saw the news that Wind Waker was being remade for the Wii U, laughed, thought it was a dream then went back to sleep. It's only a couple of hours later, when I woke up again and noticed it was still there, that I realized the news was true. Cue celebrations. See, of all the thousands of video games I've played in my life, Wind Waker is my absolute favourite. Hands down. I like it so much, in fact, that I could initially excuse Nintendo's cynical re-release policy and actually consider buying it. Then I had a cup of tea, a sit down and a quick think about it and realised, no, it wouldn't be that easy. The copy of Wind Waker I've got on my shelf still works in my GameCube, and still to this day looks amazing. The copy I run on the Dolphin emulator on my PC looks even better. Why, then, would I care about another version coming out, when the versions I've got work just fine? Video Options - The biggest problem this project faces is that, unlike most other HD remakes, the original doesn't need the "improvement." The beauty of Wind Waker's art style is that it's about as timeless as a video game can be. The clean lines and bold colours still look great in SD, and if you're playing on PC, there aren't muddy textures ruining your eyeballs like there are on other older titles. So the addition of fancy lighting, bloom, saturation and shadow effects looks... weird. A bit much. So it'll be great (though I admit, given the developer also unlikely) if you could turn them off. I mean, compare the two images using the slider up top. The left image—running on the Dolplin emulator for the PC—is better in just about every way. Tingle Tuner - You'd be forgiven for having forgotten about this, but the original GameCube version boasted GBA connectivity courtesy of the Tingle Tuner. This let a second player take control of a low-res version of Tingle on the GBA's screen, able to do things like spot hidden items. This is so perfect for the Wii U pad's screen it's not even funny. And would be a great chance for most players to experience something even the majority of Wind Waker veterans never got a chance to try out. Camera - One of my favourite diversions in Wind Waker is the photography minigame, where snaps of the game's characters can be exchanged for small virtual action figures. It's a fun game, but on GameCube the first-person controls were always a little janky. Again, putting this on the GamePad is a must. Extra Content - The original version of the game shipped with a few rooms and areas in the code that weren't accessible in the main game. It'd be neat to have some of these—at least those where possible—slipped into the main game. Wind Waker - The way you selected notes always felt a little weird. The Wii U supports Wii Remotes, so... can we just wave one of those around in the air instead? Before you even say it, yes, this kind of nitpicking is a little absurd. This is the kind of project I should be all over. I'd be as close to the target market as Nintendo would hope for. Yet here I am and all I can do is complain. But then, what else should they expect? Part of the reason this game is still so beloved is that it still looks so damn good, removing the need for an HD remake. So if Nintendo wants this to be as relevant as, say, the recent Ocarina 3D re-release—a game that was in need of a makeover—it's going to need to work a little harder. Of course, aside from the brief introduction yesterday we know almost nothing about the game other than what we saw. So for all we know, Nintendo could already be planning on including some/all of that. In which case... well, carry on, Nintendo, carry on. 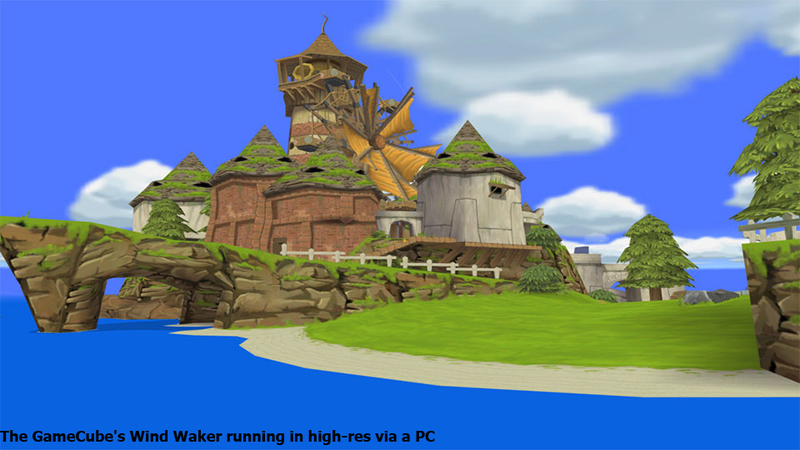 Here's how Wind Waker originally looked like back when it was released in 2002.